These codes are SERIES SPECIFIC. Which in short means, a Pokemon Plasma Blast Code can only be redeemed for a Pokemon Plasma Blast Online Booster Pack in the Pok�mon TCG Online shop. You will not be able to purchase this code and use it to unlock digital booster packs from any other expansion except the Plasma Blast Expansion. You are NOT purchasing actual physical card but the code delivered to you thru email which will give you a Pokemon Online Pack to access to play online. 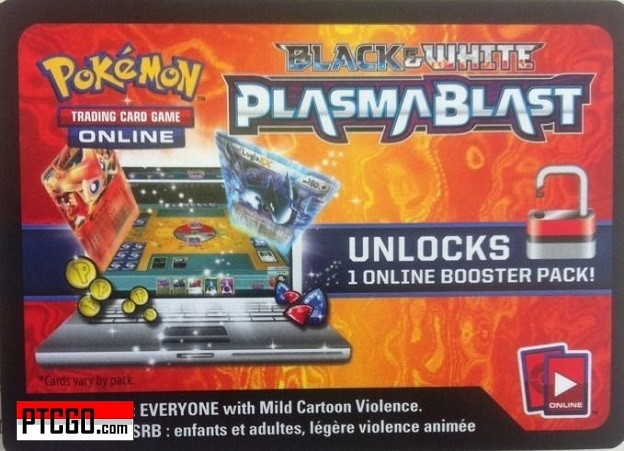 The code you are purchasing will unlock a pack of Pokemon Plasma Blast cards to your online account for play. If you have any questions use our live help operator system to submit your question and we will do our best to answer you. 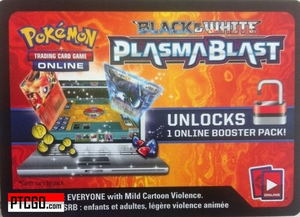 Plasma Blast is the tenth expansion of cards from the English Black & White Series of the Pok�mon Trading Card Game. Plasma Blast and the Japanese equivalent Megalo Cannon feature the debut of Genesect in the Pok�mon Trading Card Game, as well as Team Plasma, their Pok�mon, and for the first time since their debut in Plasma Storm, cards designed to specifically counter Team Plasma. Along with the typical Pok�mon and Trainer cards, Plasma Blast sports Pok�mon-EX cards, Ace Spec cards, a Special Energy card, Full Art cards, and Shiny Secret cards. In order to help defend against Team Plasma's onslaught, Unova champion Iris is present alongside Caitlin, a member of the Unova Elite Four. Six Pok�mon-EX are included: Virizion-EX, Jirachi-EX, Kyurem-EX and Team Plasma's Genesect-EX, Dialga-EX, and Palkia-EX. Many of the Pok�mon present are not from Generation V, but instead are Pok�mon from older Generations, some of which not featured in the Card Game since the Diamond & Pearl Series. Plasma Blast is only the third set of the BW Era to feature Fossils. Archen and Tirtouga are given their second cards, while Lileep is given its first printing as a Restored Pok�mon. Plume Fossil and Cover Fossil are reprinted, and a new fossil Trainer card, Root Fossil Lileep is included in favor over the old Root Fossil in order to prevent confusion over how the card should work. The expansion also includes a new iteration of Technical Machines. Because Technical Machines in the Pok�mon games now have unlimited uses, they are now present on Pok�mon Tool cards, instead of being a separate Trainer card class discarded at the end of the turn. Great pricing and fast services! Plasma Blast is the last pokemon tcg expansion and the most requested on the market at the moment. Here is a Plasma Blast Booster pack code for Pokemon TCG Online, sold at a very good price. It arrives quickly and also the customer service is nice if you have any troubles with the orders. Fast and effective delivery, to be recommended!